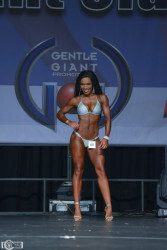 I am a 27-year-old bikini fitness competitor from South Africa and a certified Personal Trainer, based in Johannesburg. Ms. Health and Fitness and Jared Allen's Homes for Wounded Warriors would like to thank Victoria Sethabela and her voters for helping us donate $179,724.93 to our injured United States military veterans! I would recommend they try different types of training regimes and find one that is best suited for them and would enjoy. A healthy diet is a must. A well balanced diet that can be maintained on a daily basis. As a personal trainer, I work with different individuals on a daily basis and it’s an honor to know that my services contribute to their lives transforming in a positive manner. As a competitive athlete I learn more about self discipline with every routine and get to learn more myself as an individual. I’m still relatively new to this industry and still trying to make a name for myself, so with $20 000 I would definitely invest it in my business as a fitness professional, as I intend to expand it beyond just being a trainer, and also as a competitive athlete it would come in handy with my preparations for major events.